Thanks to Phantom8866, I decided to put up experimental builds for the work-in-progress AI. So I will be uploading builds in which you guys can try out how the AI is coming out and give me feedback and suggestions! Of course, the AI will be doing some weird stuff, cause I'll upload progress without making sure everything is stable and functioning. That being said, I'd like to show the AI's current state and how I approached its development and tackled problems. Besides that, I'm pretty happy with how the combat is turning out, and I'd like to focus on that a bit and tell you how I decided to do things. My approach to AI is to start by making the perfect machine, the perfect combatant... well at least to the extent I'm capable of. So the first thing I did was making the AI's reflexes instantaneous so that there is no way to get through its blocks, as you see in the video below. Afterward, I just needed to add weighted random functions on timing and direction errors (weighted based on AI skill). The same approach was also applied to parrying. For the attack, I simply have parameters to define "aggressiveness" by interval deviation. 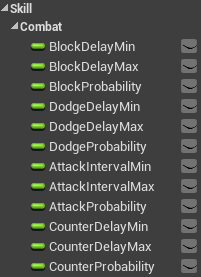 Of course, the AI will not start an attack if an attack is already incoming, he will instead try blocking it to counter-attack. Again, this "perfect" behavior just needs to be driven by error parameters. For now, I set them to something that seemed decent, but as the developer of the game, I completely kick a** in it :), so I don't know if I made the AI too strong. Therefore, I can't wait for your feedback! This is very interesting stuff, Will keep an eye on this for sure. Awesome to hear that, thank youu! :). Oh btw, have you tried the demo?